WASHINGTON, May 7, 2011 — U.S. pub­lic ser­vants are the most ded­i­cat­ed, capa­ble and hon­est in the world, Defense Sec­re­tary Robert M. Gates said today dur­ing a com­mence­ment cer­e­mo­ny at Wash­ing­ton State Uni­ver­si­ty, in Pull­man, Wash. The sec­re­tary, on the eve of his own retire­ment, used the podi­um to urge the grad­u­ates to con­sid­er ded­i­cat­ing at least part of their careers to some type of pub­lic ser­vice. 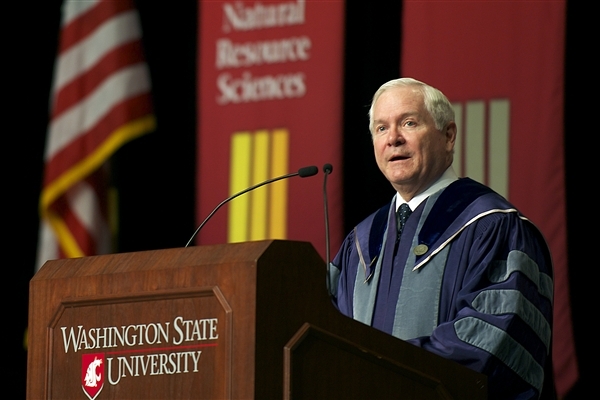 Defense Sec­re­tary Robert M. Gates address­es the audi­ence dur­ing the Wash­ing­ton State Uni­ver­si­ty com­mence­ment cer­e­mo­ny, May 7, 2011. Gates choked up briefly when recall­ing his most recent tenure as defense sec­re­tary, say­ing he will be for­ev­er thank­ful for the oppor­tu­ni­ty to lead today’s mil­i­tary. And he was still vis­i­bly emo­tion­al in his clos­ing as he issued a chal­lenge to the 2,350 grad­u­ates. “And so I ask you … will the wise and the hon­est among you come help us serve the Amer­i­can peo­ple?” Gates asked. Gates’ plea came in con­trast to ear­li­er jokes about life with­in the Wash­ing­ton, D.C., belt­way, as he often does in his speech­es. “It’s a spe­cial plea­sure to be with you here today, espe­cial­ly since it gives me an excuse to get about as far away from the oth­er Wash­ing­ton as one can get with­in the con­ti­nen­tal Unites States,” Gates joked. Gates also joked about par­ents who will con­tin­ue to shell out mon­ey even after their chil­dren grad­u­ate. And he acknowl­edged that he was the only obsta­cle between the grad­u­ates and their grad­u­a­tion par­ties. So Gates kept his promise to keep his speech short. But he packed the 15 min­utes he spoke, with praise for the sac­ri­fices of those who serve their coun­try in and out of uni­form. He quot­ed bil­lion­aires and film direc­tors, an opera star and an actress, pres­i­dents and their par­ents. It was in his own words, how­ev­er, based on a life­time of pub­lic ser­vice, that the seri­ous­ness of the mes­sage crept. Now, more than ever, the Unit­ed States needs the tal­ents of its best and bright­est, he said. “You are grad­u­at­ing in chal­leng­ing times, of that there is no ques­tion,” Gates said, cit­ing a decade of war, a peri­od of wrench­ing eco­nom­ic tur­bu­lence and a huge bud­get deficit and nation­al debt. Gates said it is no sur­prise that recent polls show a sour­ing of the pub­lic mood, with many Amer­i­cans pes­simistic about the tra­jec­to­ry of our coun­try. But, Gates said, he has lived through times when such pes­simism was as preva­lent. In 1957, when Gates was a fresh­man in high school, the Sovi­et Union launched its Sput­nik 1 into space, and Amer­i­cans feared being left behind in the space race. Even more cause for wor­ry was being left behind in the mis­sile race, he said. In the 1970s the nation went through anoth­er peri­od of ques­tion­ing its place in the world, brought about by the angst over the Viet­nam War and the OPEC oil embar­go, fol­lowed by sky-high infla­tion and equal­ly high inter­est rates, he said. And in the late 1980s America’s grow­ing fis­cal and trade deficits left many wor­ried that we would soon be tak­en over by Japan, Gates added. “I lived through each of these peri­ods of declin­ism when many were con­vinced Amer­i­ca was stuck in a down­ward spi­ral,” Gates said. “And yet, after meet­ing the many chal­lenges we faced head on, our nation emerged from each of these peri­ods stronger than before, and I am con­vinced we will do so again. “Indeed today, as through­out our his­to­ry, this coun­try remains the world’s most pow­er­ful force for good. The U.S. will, I am con­vinced, remain the indis­pens­able nation, and our coun­try will be able to adapt and over­come once again as it has in the past,” he said. How­ev­er, espe­cial­ly in times of fis­cal con­straint, the Unit­ed States must come up with inno­v­a­tive solu­tions to the chal­lenges it faces. “It is pre­cise­ly dur­ing these try­ing times that Amer­i­ca needs its best and bright­est young peo­ple from all walks of life to step for­ward and bring their tal­ents and fresh per­spec­tives to bear on the chal­lenges fac­ing this coun­try,” Gates said. “Because while the oblig­a­tions of cit­i­zen­ship in any democ­ra­cy are con­sid­er­able, they’re even more pro­found and more demand­ing as cit­i­zens of a nation with America’s glob­al chal­lenges and respon­si­bil­i­ties, and America’s val­ues and aspi­ra­tions,” he said. Gates encour­aged the grad­u­ates to find out what dri­ves them, to find their pas­sion and to pur­sue it with all of their ener­gy and com­mit­ment. But he asked that they con­sid­er spend­ing at least part of their careers in pub­lic ser­vice. “You will have a chance to give back to the com­mu­ni­ty, the state, or to the coun­try that has already giv­en you so much,” he said. Gates said that he under­stands that with today’s polit­i­cal rhetoric, pub­lic ser­vice may not be appeal­ing. “Cyn­i­cism about the peo­ple and the insti­tu­tions that gov­ern and pro­tect our coun­try can be cor­ro­sive,” he said. The sec­re­tary said he wor­ries that too many of bright­est young Amer­i­cans, nor­mal­ly engaged in vol­un­teerism, turn aside careers in pub­lic ser­vice. Gates, who served under eight U.S. pres­i­dents, said he has worked with polit­i­cal appointees and career civ­il ser­vants of the high­est qual­i­ty, act­ing with stead­fast integri­ty and love of coun­try and what it stands for. But, he added, “to serve our coun­try you don’t need to deploy to a war zone or a Third World coun­try or be buried in a win­dow­less cube in goth­ic struc­ture by the Potomac Riv­er. “You don’t have to be a CIA spy, or an ana­lyst, a Navy SEAL who tracked down and brought down the most noto­ri­ous ter­ror­ist in the world,” he said. “What­ev­er the job, work­ing in the pub­lic sec­tor at some lev­el offers the chance to serve your fel­low cit­i­zens as well as learn the inner work­ings of our gov­ern­ment and build skills that will stand you in good stead in fac­ing oth­er chal­lenges in your career and in your life,” he said. Gates said the grad­u­ates live in a time of “great neces­si­ties” when the Amer­i­ca can­not avoid the chal­lenges of address­ing its domes­tic prob­lems, or the bur­dens of glob­al lead­er­ship. “The stakes are unimag­in­ably high,” Gates said. “If, in the 21st Cen­tu­ry, Amer­i­ca is to con­tin­ue to be a force for good in the world, for free­dom, jus­tice, rule of law, and the inher­ent val­ue of each per­son, then the most able and ide­al­is­tic of our young peo­ple — of you — must step for­ward and accept the bur­den and the duty of pub­lic ser­vice. “I promise you that you will find joy, sat­is­fac­tion, and ful­fill­ment,” he said. Gates’ wife, Becky, is a Wash­ing­ton State Uni­ver­si­ty grad­u­ate and mem­ber of the Col­lege of Lib­er­al Arts Advi­so­ry Coun­cil. Their son, Brad, is a 2003 grad­u­ate of the uni­ver­si­ty. Gates has plans to retire in the state.